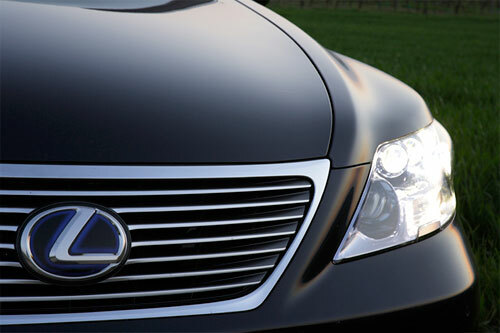 The LS 600h vs. the LS 460: Is the hybrid really worth the extra money? The 600h costs $35,000USD more than a similarly equipped 460. People buying a car in this price range ($100,000USD +) don’t really care about gas mileage, which is the most practical reason to buy a hybrid. 600h is only marginally better than the 460 in MPG. The 600h has a reduced trunk size due to the hybrid engine, leaving it with less room than a 2007 Jetta. Both models have virtually the same 0-60 mph time, even though the 600h has 50bhp more power. This is due to the extra weight of the hybrid engine, which adds 887 lbs. With these points in mind, it’s hard not to agree with his conclusion. However, little weight seems to have been given to the LS 600h’s exclusive features: LED headlights, All Wheel Drive, multi-zone climate control with infrared body temperature sensors, more wood and leather, and an optional Active Stabilizer Control system which provides better stability. With the exception of the ASC, these features cut directly into the price difference between models, and definitely put the 600h a cut above the 460. McCulloh’s comparison also dismisses the environmental impact of driving a hybrid, which can not be discounted as a motivator to buyers in this price range, with their jetsetting and yachts sucking up fuel. Really, it’s a debate for debate’s sake, as most of the 2008 production run of the 600h/600hL is already spoken for. Someone’s buying them.